This is the heart warming tale of Rose, her golem friend, and Rose’s many horrible, brutal, gore-filled deaths. The game starts with no preamble. A young girl with a giant flower attached to her body, Rose, wakes up in the ruins of a castle. Through your first few minutes of gameplay, she quickly discovers two things: 1) the ruins are basically a death trap and 2) when she dies (often in a spray of violent gore), she is reborn in a new body grown out of a nearby flower. But one thing is clear, while technically immortal, she can still most definitely feel pain—and remember it throughout her reincarnations. Luckily, Rose is not long alone in her quest to escape the castle. She soon comes across a golem. While she at first fears the hulking creature, his actions quickly prove him to be a steadfast ally. Alone, neither can escape; but together, their unlikely friendship can overcome any obstacle. Like Yomawari: Night Alone, NIS’ previous game in this style, Rose and the Old Castle of Twilight is a tale of innocence clashing with the supernatural. Rose is a normal girl. She is typically terrified by everything she and the golem encounter. And while her fear can and does overcome her from time to time, beneath it is a growing bravery to press on and overcome the obstacles in her way. It’s almost painful to watch her suicidally enter death traps quaking in fear—knowing as she does that her death is the only way to open up the castle’s next area. Yet, in the end, it is not bravery that sees her through her adventure, but the simple, honest drive to do the right thing. The innocent goodness at the core of her being stands as a beacon of light in a game of darkness and gore. It is this contrast that gives the game its soul. Rose and the Old Castle of Twilight is likewise a tale of friendship and mystery. Rose and the golem are dependent on one another, but said dependence soon grows into a strong and true friendship—an impressive bit of storytelling when one of the two is a towering mass of rock with no face nor capability for speech. Yet, even still mysteries abound. What exactly is the golem? And who is Rose for that matter? Why are they in the castle and why is it in such ruin? The answers to several of these questions test the two’s burgeoning friendship and add a helping of personal drama to the story. One of the game’s best aspects is how the story itself is told. There is almost no dialogue in Rose and the Old Castle of Twilight—and none at all from Rose and the golem. Rather, we learn what is going on from Rose and the golem’s actions and from blood memories gathered from throughout the castle. These blood memories are short, little cutscene vignettes collected from the bloody bodies of the castle’s staff that show the events leading to the fall of the castle. Some directly pertain to Rose’s own past while others show hints for escaping the castle. These are completely unvoiced and rely exclusively on visual storytelling. While the main story is perfectly understandable from the blood memories alone, there are also books and notes to collect and read if you want more backstory on the lore and world of Rose and the Old Castle of Twilight. 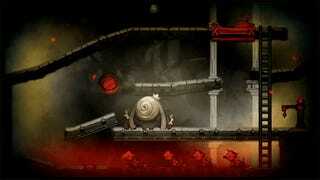 As for the gameplay, Rose and the Old Castle of Twilight is a puzzle platformer. The goal for each room in the castle is to reach the exit. To do this, you must utilize Rose’s powers and those of the golem. The castle itself seems to be frozen in time at the moment of its final destruction. 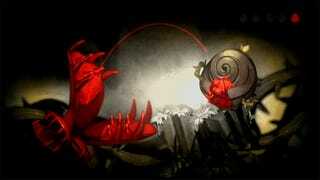 Rose, thanks to the flower on her back, has the ability to draw blood out of an object and put it into another. When blood enters an object, it is no longer frozen in place and moves normally. Blood-filled objects can then be moved about by the super-strong golem. Of course, this is just the most basic use of their powers. Over the game you utilize a bloody watering can, create blood paintings, and traverse gorges on the back of man-eating insects. At any time you can switch between Rose and the golem. Often, the room puzzles require you to split up the pair. The main cause for separation is so that the golem can chuck Rose onto a level neither can normally reach. And as each has strengths, they also have weaknesses. The golem is basically un-killable (unless falling into a bottomless pit) but is too large for many places. Rose, on the other hand, dies from just about anything. While a fall from a middling height ends in the cutest little faceplant you’ve ever seen, a few feet higher leaves the girl in a pool of her own blood. Of course, as the story is about friendship, the two working together are stronger than apart, with Rose likewise becoming unkillable if she is being held by the golem. There are some decent extras in Rose and the Old Castle of Twilight—including three different endings. There are blood memories and scrolls/books to collect to flesh out the plot. And for speed runners, the game automatically saves your best times for each room in the castle. All in all, this little budget title (about $35 here in Japan) takes about eight or nine hours to master. For a game so fun, cute, and creative, it was certainly worth every cent. 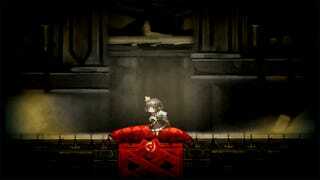 Rose and the Old Castle of Twilight is a great piece of interactive visual storytelling. 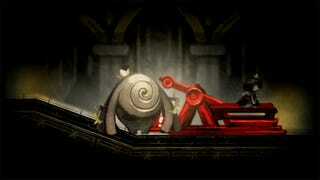 Not only is it a tale of friendship and innocence colliding with the eldritch, but also a well-built puzzle platformer. 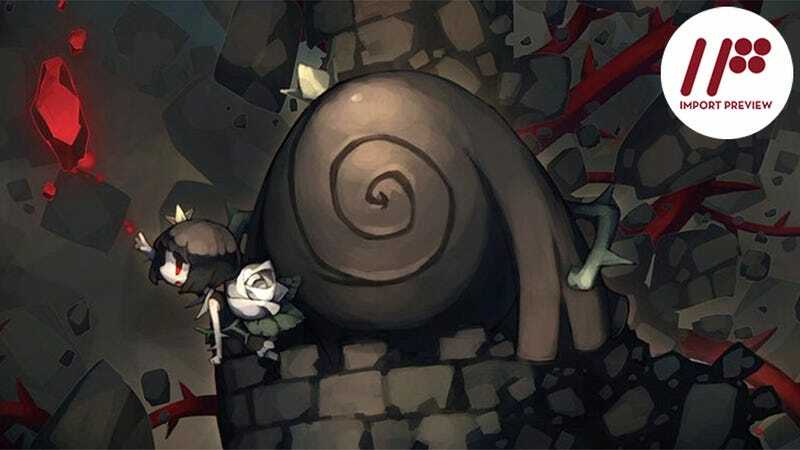 Like Yomawari before it, Rose and the Old Castle of Twilight is a game that was simply a joy to play—even if the final boss destroyed me for hours on end. And as we part, I give you a gif of my single favorite jump in the game. Rose and the Old Castle of Twilight was released on April 26, 2016, for the PlayStation Vita in Japan. There is currently no word on a Western release.